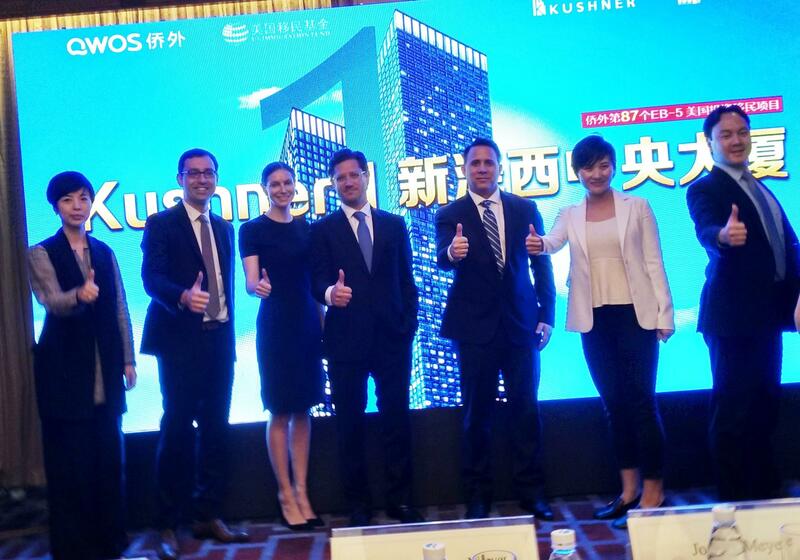 Nicole Kushner Meyer (third from left), the sister of White House senior adviser Jared Kushner, poses at a promotional event in Shanghai on Sunday. Networking, connecting, pitching — it's all routine in the business world. But a connection pitched in China over the weekend — involving ties between President Trump's son-in-law Jared Kushner and a real-estate project — has prompted ethics experts to raise objections, and some lawmakers to call for change. There are concerns about potential conflicts of interests, but also about a visa program for investors. At the White House press briefing on Monday, spokesman Sean Spicer said Kushner has taken necessary steps to prevent conflicts of interest. "Jared has done everything to comply with the ethics rules to make sure and that had nothing to do with him per se, he wasn't involved," Spicer said. But Larry Noble, general counsel for the Campaign Legal Center, says, "The strong feeling is that they — the Trump family, the Kushner family — see the White House and being in the government as a marketing opportunity." The controversy began when reporters from The Washington Post and The New York Times sat in on a publicly advertised event at the Ritz-Carlton Hotel in Beijing on Saturday. Before being asked to leave, reporters heard Jared Kushner's sister Nicole Meyer tell Chinese investors that they could participate in a New Jersey real estate project that "means a lot to me and my entire family." Meyer noted that if investors put at least $500,000 into the Kushner-family backed project, they could qualify for an EB-5 visa. Those are the visas, created in 1990, that provide eligible immigrant investors with a path that can lead to permanent residence. Their investments just have to create at least 10 full-time jobs for U.S. workers. And the pitch came with a sweetener: Meyer talked about the Kushner family, including her brother who holds a powerful position in the White House as senior adviser to President Trump. Noble said the type of pitch offered in China "is not unheard of in other countries where you get to the leader by ... financially supporting the family." Investors are receptive to such pitches because they believe "you're getting a chance ... to basically do business with the government or the family of people high up in the government. And it's a very valuable thing in a lot of other countries," he said. Richard Painter, who was the chief White House ethics lawyer for President George W. Bush, tweeted his objections on Monday. "Abuse of power pure and simple. Congress should cancel EB-5 visa program if Kushner properties not disqualified," he tweeted. Sen. Dianne Feinstein, D-Calif., the Senate Judiciary Committee's ranking member, says the Kushner situation shows Congress should change the EB-5 rules. The visa program is "rife with fraud and abuse," she said in a statement. "In addition to numerous cases of securities fraud, the program is frequently exploited by real estate developers to finance projects in the wealthiest parts of this country. This is a far cry from the program's original intent to spur economic development in depressed communities." Attorney Blake Roberts at WilmerHale, which is Kushner's personal counsel, says his firm's client has no involvement in the project being pitched by his sister. And Kushner Companies spokesperson James Yolles said Meyer apologizes if the mention of her brother was in any way interpreted as an attempt to lure investors. Kushner had been running the family business until he went to the White House in January as a senior adviser to the president. At that time, he resigned from the daily operations, and sold assets in some projects to family members. Noble says the overlap between the White House and family business — whether the Trumps or the Kushners — has become a persistent problem. "We're seeing this over and over again," he said. "If called on it, they may apologize ... or say that's not what they did." Anybody in business can tell you that connections matter. And if you want a connection to the president of the United States, what better way than through his family? Jared Kushner is the president's son-in-law and close adviser. His sister went to China and made a pitch to investors over the weekend. Reporters were watching the session, which promoted her company's ties to the White House. NPR's Jackie Northam reports. JACKIE NORTHAM, BYLINE: The pitch made by Jared Kushner's sister, Nicole Meyer, to Chinese investors in Beijing and Shanghai was clear. Their $500,000 investment towards a real estate project in New Jersey could earn them a path to residency in the U.S. But the pitch came with a sweetener. Meyer talked about the Kushner family, including her brother, who holds a powerful position in the White House as senior adviser to President Trump. Larry Noble with the Campaign Legal Center says the marketing push was inappropriate. LARRY NOBLE: This is not unheard of where in other countries, the way you get to the leader is by financially supporting the family, even if none of the money goes directly to the leader. And the perception is that what you're getting a chance here is to basically do business with the government or the family of people high up in the government. And that's - it's a very valuable thing in a lot of other countries to be able to do that. NORTHAM: The law firm representing Jared Kushner says their client has no involvement in the project being pitched by his sister. And a spokesperson for Kushner Companies said Nicole Meyer apologized if the mention of her brother was in any way interpreted as an attempt to lure investors. Jared Kushner had been running the family business until he went to the White House. That's when he resigned from the daily operations and sold assets in some projects to family members. White House spokesman Sean Spicer says Kushner has taken necessary steps to prevent conflicts of interest. SEAN SPICER: Jared has done everything to comply with the ethics rules to make sure that had nothing to do with him, per se. He wasn't involved. NORTHAM: But Noble says this overlap between the White House and family business, whether the Trumps or the Kushners, can't be taken as just a single event. NOBLE: We're seeing this over and over again. And the strong feeling is that they, the Trump family, the Kushner family, see the White House and being in the government as a marketing opportunity. NORTHAM: Noble says that may send a signal to future administrations and government officials that they too may run a business while in high office. Jackie Northam, NPR News, Washington. Transcript provided by NPR, Copyright NPR.